‘The North West quarter of Copenhagen could do with a little more adventure’. Such was the idea behind The North West Park, designed by SLA. North West is the most culturally diverse quarter in Copenhagen with almost twice the amount of non-western immigrants as in the rest of the city. As a result, the quarter has had its share of social and economic troubles: The inhabitants of North West are poorer, more often unemployed, and live in smaller public-housing apartments than their fellow Copenhageners. North West itself is a grey area with little public life and is known for its high rates of crime and pollution. It is not a coincidence that North West is popularly known to the rest of Copenhagen as ‘North Worst’. With SLA’s design of their new public park, the people of North West was handed a unique opportunity to reinvent themselves. The goal was to transform a vast, fenced, empty space (formerly the contaminated area of the city’s bus terminal/garage) into a space where people of all races, nationalities and ages can meet. With a magic mix of lights, colors, trees, poetry and even small mountains, new adventures and stories was introduced to North West; a place where the quarter’s residents – with all their differences and colors – would find space to unfold themselves and flourish all year round. Under the title ‘1001 trees’ the park consists of four simple, but effective elements: trees, paths, light, and cone-shaped mounts. These elements create order and coherence between the park’s many different parts. All four elements are distinct features of the park. Their simple, but varied compilation create a sequel of changing spaces and corners with altering atmospheres and feelings, which differentiate the park from the area’s grey and fragmented environment. The trees of the park were selected to have a variety of different geographical origins, creating a beautiful and exciting encounter between traditional species of the Danish latitudes and exotic species from around the World. This reflects the multicultural nature of the North West area – and is also intended as a critical commentary to the restrictive Danish immigration laws. The shapes and colors of the trees are completed by a ‘magic forest’ of lamp posts and artificial lights. At daytime, one wanders through the architectonic composition of elegant lamp posts striped in different colors, cold ones in the North, warm ones in the South. At night, one is surprised by projected light, designing different patterns and colors on the ground. The extensive lighting will also make the park a safe and secure place to be – both day and night. The trees will be lit in colors – red, green and blue – and additional lights will be triggered by passers-by so as to enrich the sparkling experience of visiting the park. At some places, it is as if the stars of the Milky Way have fallen down to earth in the combination of projected light and star-shaped concrete objects cast into the ground. Passers-by may think of being part of a whole new universe, or this universe that we all share despite of different origins, religions and cultures. Children from the surrounding schools were invited to write poems about their vision for the area. These poems can now be seen in the children’s original handwriting on the asphalt path that runs through the park. The white text on a black background seems to hover over the ground as one pursues the perspective of the continuing poems, surrounded by the stars scattered around the landscape. This again gives the visitor the feeling of being in another universe. The broad path is not only the park’s illuminating backbone, but also the focal point for the flow of human activity. And while the grass invites people to sit, lie, have a picnic, or to explore by play, leisure, or sports, the path is the place where one will meet new friends, play chess, or where one simply can lean back and watch the flow of life. North West as an area is going through changes. 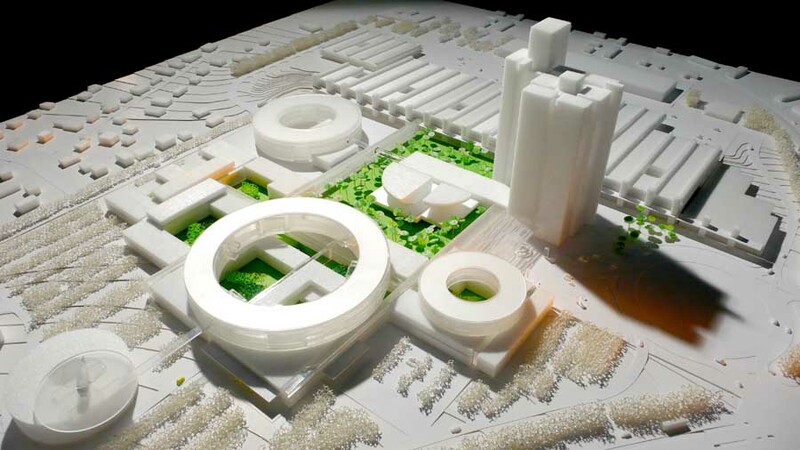 With SLA’s design the park is a symbol and leader in this positive change. The North West Park is providing a run-down neighbourhood with an open park that protects and mirrors the diversity and changeability of the area. A park that reflects the diversity of the area, the adventurous spirit, the strong engagement, the need to get lost in the crowd and to seek into the quiet realm of reflection. A park that embraces the need for everyone to feel welcome, while in quality competes with the finest urban spaces of Europe.